Blue Whale Press LLC, 9780981493862, 168pp. An award winner from the time it left the pen, this is the first book in the Sienna, the Cowgirl Fairy chapter book series. Sienna is not your normal cowgirl. She's half human and half fairy But Sienna wants nothing to do with fairies. When her ma sends her to fairy camp instead of cowgirl camp, she ain't none too happy. Not only must she deal with cliquish fairies who reject her spunky spirit and outspoken ways, she must also noodle out how to help Mother Nature end the Texas drought. Can Sienna balance cowgirling with some tried 'n' true fairy skills to both fit in and make it rain? This is a book about perseverance, friendship, and teamwork. In addition to being delightfully entertaining, this book may help children learn tolerance with the message that people who appear to be different from you can be very much like you. It may also help children who are struggling with identity or self-acceptance. 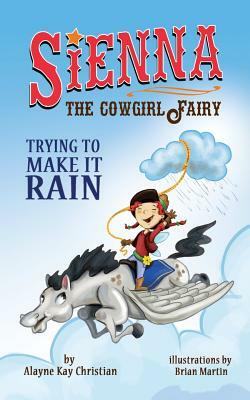 A fun book for children with interest in cowgirls, fairies, magic, horses, rainmaking, or Texas.